Rabbit polyclonal Lrp2 / Megalin antibody. Validated in WB, ELISA and tested in Recombinant fragment. Independently reviewed in 1 review(s). Immunogen corresponding to synthetic peptide. Our Abpromise guarantee covers the use of ab56014 in the following tested applications. WB Use at an assay dependent concentration. Predicted molecular weight: 517 kDa. This antibody has been tested in Western blot against the recombinant peptide used as an immunogen. We have no data on detection of endogenous protein. Absorptive epithelia, including renal proximal tubules. Defects in LRP2 are the cause of Donnai-Barrow syndrome (DBS) [MIM:222448]; also known as faciooculoacousticorenal syndrome (FOAR syndrome). DBS is a rare autosomal recessive disorder characterized by major malformations including agenesis of the corpus callosum, congenital diaphragmatic hernia, facial dysmorphology, ocular anomalies, sensorineural hearing loss and developmental delay. The FOAR syndrome was first described as comprising facial anomalies, ocular anomalies, sensorineural hearing loss, and proteinuria. DBS and FOAR were first described as distinct disorders but the classic distinguishing features between the 2 disorders were presence of proteinuria and absence of diaphragmatic hernia and corpus callosum anomalies in FOAR. Early reports noted that the 2 disorders shared many phenotypic features and may be identical. Although there is variability in the expression of some features (e.g. agenesis of the corpus callosum and proteinuria), DBS and FOAR are now considered to represent the same entity. Contains 36 LDL-receptor class A domains. Contains 37 LDL-receptor class B repeats. ab56014 has not yet been referenced specifically in any publications. Publishing research using ab56014? Please let us know so that we can cite the reference in this datasheet. for the best antibody to test in worms. Thank you for contacting us. I did BLAST searches of our LRP2 antibodies against C.elegans and found that the highest match was with ab56014 with 78%. Usually we like to say that 85% homology between the immunogen and the species will give likely reactivity. This antibody also had a 75% homology with LRP1, so this may not be a good choice for you. All other LRP2 antibodies had lower homology with C. elegans and are not likely to react. Dear Supplier, Please see technical inquiry from our customer below: I have purchased ab56014 anti-Lrp2/megalin antibody (lot GR57822-1) 2-3 month earlier and after delivery stored at 4°C but received no document regarding shelf-life. The vial was stored unopened at 4°C after delivery. Could you please provide some idea about the shelf-life of this product. Will it be ok for me to use now? Looking forward for your response. We do not have set expiration dates for our products. Most antibodies are stable and can last for anywhere from a few months to several years if stored properly, so we strongly recommend that you follow the storage instructions on the datasheet for the antibody you purchased. These conditions will vary among our antibodies, therefore, it is important to verify the storage conditions for each of our products when you receive them. We guarantee all of our products to work for at least 180 days from the date of purchase when stored correctly. Storage at +4C for this long of a period may or may not have affected the product. I would recommend use as normal to determine if there has been any adverse affect. For more information on antibody storage and stability, please visit our Antibody Storage Guide on our Protocols and Troubleshooting Tips page (https://www.abcam.com/index.html?pageconfig=popular_protocols). I have included this as an attached pdf as well. kidney lysate ab44687, which was loaded on the gel as is. 3. the transfer buffer composition: Tris, Glycine and methanol in dH2O. 4. the transfer was for 2hr in 200mA. 6. The membrane was exposed to the film for 1, 5, 15 and 60 min. 7. No primary control was performed. before what is the expected size of bands when using this lysate? Thank you for providing that extra information. The band that can be expected with this lysate is the predicted 517 kDa, however, to our knowledge, this lysate has not been specifically probed for Lrp2 and I cannot therefore be sure of this. Additionally, ab56014 has not been used to detect the endogenously expressed protein in western blotting in house (which is also seems to betrue of the Sc-25470). Only recombinantly expressed protein fragments have been detected. This makes performing the western blot considerably easier as the transfer of the smaller recombinant protein is much less problematic than transferring a 517 kDa protein. Can I ask, are you seeing any bands after performing the western blot or is the membrane completely blank? If you could possibly share an image of the blot obtained that would be very helpful. What was the result of the "no primary" control? 1.I would prepare the protein samples by heating for 10 minutes to 70 degrees. If you are not already doing so I would also used a reducing agent in the loading buffer. This is not necessary with the control lysate as this is already included (butthe heating step should still be performed). 2. In order to improve the transfer and binding of the protein to the membrane I would use PVDF membrane and make sure to pretreat in methanol for 1-2 minutes, followed by incubation in ice cold tranfer buffer for 5 minutes. 3. I would use a very low percentage gel in order to improve the transfer, as well as adding 0.1% SDS to the tranfer buffer as this prevents the precipitation of the protein in the gel. I would also remove the methanol from the transfer buffer as this tends to remove the SDS. Methanol is only necessary in the transfer buffer if using a nitrocellulose membrane. Removing the methanol also promotes the swelling of the membrane which allows large proteins to transfer more easily. I hope these suggestions improve the results observed so far. Performing a western blot with such a large protein will be quite difficult and may require quite a lot of optimisation in order to get a good result. I look forward to receiving yourreply. bands) / wrong band size / other? same with both antibodies, however, I did not get any bands with your antibody. used your human kidney lysate. Having reviewed this case, I would like to clarify a few details in order to be able to understand the situation more fully and hopefully be able to provide some suggestions in how to improve the results currently observed. 1. could you share with me what the other anti-Lrp2 antibody used was (manufacturers name and catalogue number)? 2. what lysis buffer was used for your other samples? 3. what transfer buffers were used (composition)? 4. how long was the transfer performed for and at what voltage? 5. you mentioned that the transfer was verified by staining of the membrane, do I assume right that the 500-600 kDa region transferred ok? Could you share the images of theseresults with me? 6. how long was the membraneexposed for? 7. has a "no primary" control been performed? One of our customers has ordered ab56014 anti Lrp2 antibody and Kidney (Human) Tissue Lysate - adult normal tissue. 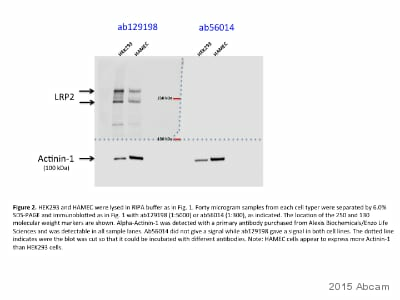 The customer used the lysate as a controlfor Lrp2 antibody reactivity. The bands received with the lysatewere around 150-200 kda and the customer has expected them to be around 400-600 Kda representing the real size of the protein. What is the expected band size withab56014 antibody? has the lysate undergone any process that might shorten the protein length? Thank you for contacting us and reporting the problems observed with using anti-Lrp2antibody ab56014 with Kidney (Human) Tissue Lysate (ab44687). In order to understand the problems your customer is experiencing further could you please pass on the questionnaire attached to this email for them to fill out. Performing western blotting with such a large protein can be very tricky and fully understanding the protocol your customer has used may shed further light on what may be the problem.